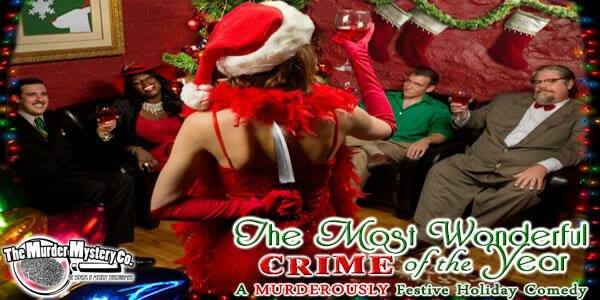 Join 3 Cheers Hospitality along with the Murder Mystery Co to bring you a fun way to celebrate the Holidays. Grab your friends, family, this could even be a way to have your office Christmas Party! Silver bells are ringing at this seasonal standup performance, but the jolly jokester gets upstaged by an event far worse than bad holiday comedy: a murder! With humbug hovering over the holiday, it is up to the unamused audience to unravel the mystery of whodunit like last year’s tacky knitted holiday sweater. While murder is making the night not-so-merry-and-bright, you must gather information, bribe your guests for clues, and solve the crime before this comedy act becomes a tragedy! 5:30 starts the social hour, dinner will be served at 6:15 and the show will start at 6:30. Buffet and full bar offered, prizes for best costumes, fun drawings and more!